It means a lot to player collectors who invest their time and money into a company’s trading card releases to know the company appreciates their efforts. Which is why Upper Deck spent some time talking with two established online hobby communities (Hobby Insider and Cloutsnchara) before the 2013 Fall Sports Card & Memorabilia Expo to find out which hard-core player collectors would be at the show. We indentified three fans from each community and created special blow-up cards from their favorite players to surprise them with at the show. This proved to be a little difficult as we had to hand carry them all the way from San Diego to Toronto in order to make sure they were not damaged, but seeing their smiles at the surprise made that small hassle all worthwhile! Jonathan who loves Paul Kariya scored this sweet blow-up showing him as an all-star! Danny is a Cam Ward fan and he loved getting this awesome blow-up card of the Carolina goalie! Cyril is a fan of Johnny Bower so we loved seeing his smile when we handed him this blow-up card! 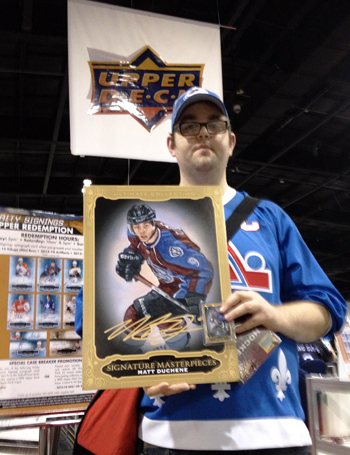 Will really scored as not only did we surprise him with a blow-up of his favorite player Matt Duchene, but also the actual autograph card! Our favorite story was the fan that came all the way from Sweden for the show. 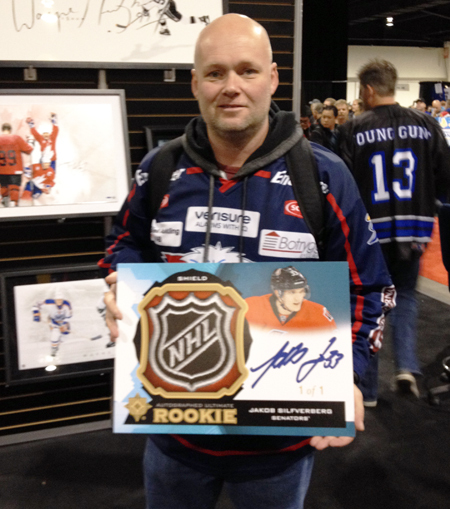 He was speechless when we shared the Jakob Silfverberg card we created for him. Shortly thereafter he sped off to find a holder for it so he could get it home without damaging it. If a collector is going to come all the way from Sweden, we’re going to make it special for him! The best part of the weekend for us was a special surprise to Jeffrey Griffith who is one of the world’s most well-known Wayne Gretzky collectors and now is working on an impressive Hockey Hall-of-Fame collection. Jeffrey actually wrote the book called “Gretzky Cards” showcasing his amazing collection of trading cards of “The Great One” with most cards coming from Upper Deck. Given the fact Upper Deck has an exclusive relationship with Wayne Gretzky, we thought someone like Jeffrey deserved to be honored for his long history of chasing Gretzky cards with something special. 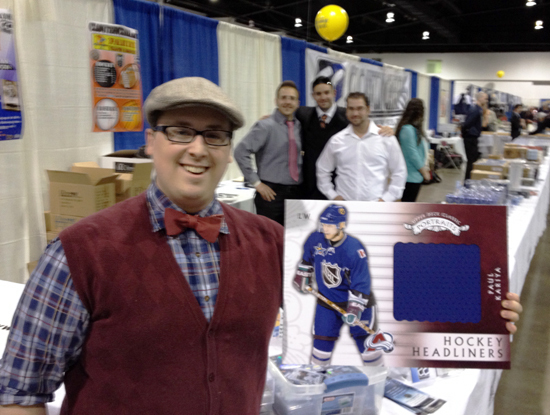 So Upper Deck worked to get a one-of-a-kind blow-up card made and signed by Wayne at a recent signing session. 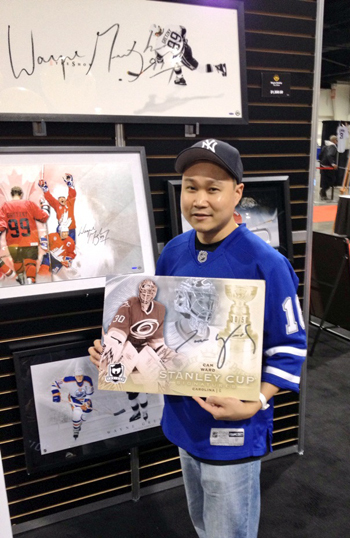 And then we surprised Jeffrey with it in front of about 250 collectors at the Fall Expo in Toronto. Check out how it went down! It was great to be able to say, “Thank you,” to these great fans throughout the weekend and we look forward to surprising more loyal Upper Deck fans in the future. Stay tuned! As one of the recipients I can honestly say that it was a very gratifying moment when I was given the card. As a hobbyist we spend a significant amount of time and finance supporting the hobby and when you see such a kind gesture from the biggest manufacturer it solidifies the belief that our hobby is good hands and moving forward in a positive direction. It also confirms that we are in this together! Thank you Upper Deck for making this collector very happy. 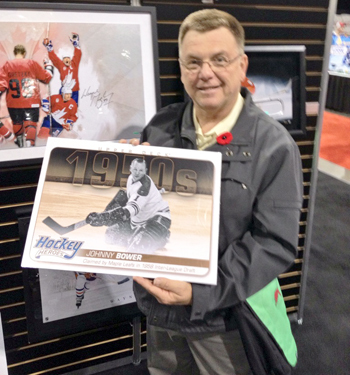 It is now time to find a reason to return to Toronto from Halifax to have Mr. Bower sign the card in person! I have a sizable (I haven’t found anyone with a larger) collection of Patrick Roy card. How can I go about showcasing my collection? Make my collection known publicly, and perhaps receive recognition such as this?